If you are in the area and have time, please stop by for a visit. More HCS2014 Guests confirmed, one bike and one car each! Here is a sneak peak introduction. This ’32 Ford is also coming! Preparing for the Open House, these are some photos of the Dragster the day before. There probably won’t be another chance for two MQQNEYES Dragsters to be photographed together. In the end we moved the MQQNBEAM, MQQNEYES Dragster and ’34 Ford together in the warehouse. After the MQQNEYES USA Open House was finished, we were invited to “The Art of The Motorcycle” event. It was held at Forest Lawn in Glendale, a famous and large cemetery that has its own exhibit/museum area, a cemetery with a museum? It was a beautiful location indeed, and the collection of bikes on display was wonderful. Every Thursday at Irwindale Raceway starting at around 4PM they have Drag Races. It’s on a weekday which is good. 5 Holes 112mm is a new bolt pattern added to our lineup. The 2nd European Hot Rod Custom Show was held in Chimay, Belgium and it rained the entire time. Having an outdoor event in California or Japan in the rain, most people don’t show up and it doesn’t get too exciting. However, here it is different. In this type of climate, the weather does not matter because it’s normal and everyone still has a great time. Almost anywhere in Europe, the weather is always changing so they don’t care about it and I was impressed how everyone had fun. Our event T-shirt was sold out in no time at all. Thank you very much to everyone. You might not be familiar with Chimay, Belgium but I bet there are many people that know Chimay Beer or at least have seen the logo. It is always served with this glass too. Very elegant. MQQN Booth in its complete form. They sent the MQQNSter over from Japan for the event. Bay Windown T-2 with an Early Bus Face. Czechoslovakia made 1960s era Tatra. Check out this air cooled V-8 and it’s a Hemi too. The sky was continuously like this all day. Luckily, it stopped raining during the awards ceremony. At night, after 10PM the sky was still not completely dark yet. No time to sleep. New product. It’s common to see on the parachute of race cars, the “Remove Before Flight” ribbon. Originally, these were used on airplanes for their safety latches etc. That’s why it has “Flight”. We took this ribbon and made a key holder. 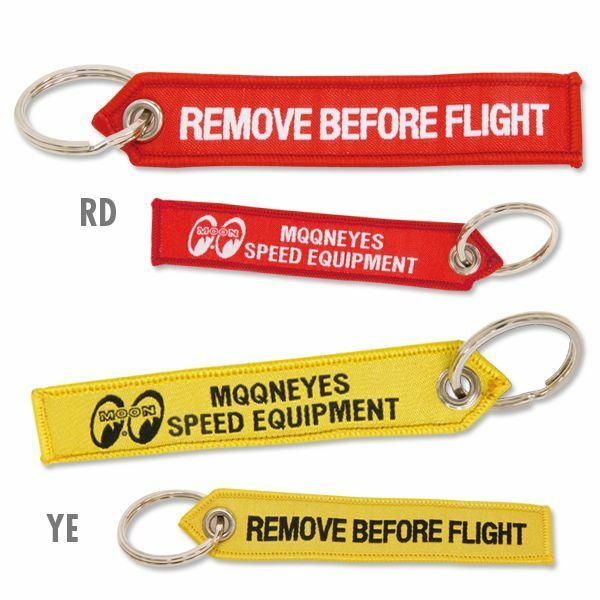 Commonly seen on fighter jets and aircraft, the classic “REMOVE BEFORE FLIGHT” tag is also seen on parachutes of dragsters and racer cars all over. This is a mini version which can be use on your interior or simply as a key ring.